Our product range includes a wide range of ampoule washer, ampoule washing device, ampoule washing machine, semi automatic multijet ampoule washer, semi automatic multijet ampoule washing machine and automatic vertical rotary ampoule washer. The washing apparatus possesses incredible technical specifications. The needle quantity of the machine is classified in 30 cycles in every hour. With a power consumption capacity of 0.25HP, this particular equipment consumes very less power. The entire machinery works on the pressure cleaning mechanism and makes very less use of the washing media. Operators can also view the entire washing process with the acrylic cover placed on the top of this ampoule washing device. By using distilled water, this device ensures perfect cleaning for all kinds of vials and ampoules. Apart from that, the machine also offers lucid operation by loading 30 trays within an hour. The machine is suitable for washing of 1ml to 100ml ampoules & vials. High-pressure spray nozzles enter into the ampoules/vials & ensure perfect wash. Totally fabricated from high-quality SS materials including the basic frame. No change of parts required for washing of vials (5ml to 30ml), hence saving the time of change over. All parts coming in contact with washing zones/jets are made from SS 316 material. The machine is totally robust and with stand continuous operation for long working hours without any trouble. Multijet ampoule and vial washing machine are equipped with a PLC system & printing facility with passwords. We offering Ampoule Washing Device, suitable to wash for ampoules and vials both. v All contact parts with the internal surface of Container and the wash media are made from AISI 316L Stainless Steel. v Other parts are made from engineering plastic, FDA approved or AISI SS 304 Stainless Steel. v All finishes, welding joints are processed, treated & equipment selected in accordance with cGMP standards. v Machine provides 3 water washes & 3 Air washes. v Complete flexibility with user for washing cycle. v Suitable for 1ml to 10ml Glass Ampoules. v Washing sequence can be made as per customer’s requirements. v 3 Pumps and 3 Tanks of 25 liters each. v Each washing zone with an independent circuit to avoid contamination. v In feed and Exit of containers. We are highly acclaimed organization influential in manufacturing and supplying unbeatable quality Ampoule Washing Machine. Our offered machines have extensive uses in the washing of ampoules with utmost precision at much faster rate. In addition to this, we manufacture these products with the use of advanced technology and finest grade raw material. We have with us wide designs of these machines for supply to customers as per their requirements. As one of the pioneering manufacturers of Semi-automatic multijet ampoule and vial washing machine, Harsiddh Sterilepack offers products of highest quality standards. The S.S construction provides lucid operation while washing ampoules of 1ml to 25ml. additionally; the washing equipment also meets the washing demands of 2ml to 100ml vials. Microprocessor incorporation enhances the functioning of the entire unit.The washing apparatus possesses incredible technical specifications. The needle quantity of the machine is classified in 30 cycles in every hour. With a power consumption capacity of 0.25HP, this particular equipment consumes very less power. The entire machinery works on the pressure cleaning mechanism and makes very less use of the washing media. Operators can also view the entire washing process with the acrylic cover placed on the top of this ampoule washing device. By using distilled water, this device ensures perfect cleaning for all kinds of vials and ampoules. Apart from that, the machine also offers lucid operation by loading 30 trays within an hour. Our machines have CE certifications. Automatic re-start and stop process during the cyclic operation further enhances your convenience while washing. Additionally, all the contact parts of the equipment exhibit S.S 316 or HDPE polycarbonate materials, thus imparting robust strength. Harsiddh rotary ampoule washing machine is a state of the art device that is designed to aseptically clean ampoules with minimum contact between the machine parts and the container. The equipment has a specially designed automatic gripping mechanism that holds ampoules from the neck, inverts them and cleans them before discharging them in the feed worm system at upright position.It is suitable for busy pharmaceutical and chemical packaging industries as it has a high production output of 240 ampoules per minute and is able to clean 1ml – 10ml ampoules. Each machine has 6 washing stations, with each station having 3 needles for water cleaning and 3 for air washing. The equipment has three 25 liter tanks and three pumps to hold and pump cleaning agents. It is also equipped with a cassette of grippers at each station to hold and turn the ampoules. The machine has automatic in feed and exit system.All internal surfaces are manufactured from stainless steel to prevent corrosion while the rests are manufactured from plastics. The fabrication and materials are made to according cGMP standards and quality is guaranteed. As one of the pioneering manufacturers of Semi automatic multijet ampoule and vial washing machine, Harsiddh Sterilepack (India) Pvt. Ltd. offers products of highest quality standards. The S.S construction provides lucid operation while washing ampoules of 1ml to 25ml. additionally; the washing equipment also meets the washing demands of 2ml to 100ml vials. Microprocessor incorporation enhances the functioning of the entire unit. Machine is suitable for washing of 1ml to 25ml ampoules. High pressure spray nozzles enter into the ampoules & ensure perfect wash.
No change of parts required for washing of vials (1ml to 25ml), hence saving time of change over. Machine is totally robust and withstand continuos operation for long working hours without any trouble. Multijet ampoule and vial washing machine is equipped with PLC system & printing facility with passwords. · Machine is suitable for washing of 1ml to 25ml ampoules. · High pressure spray nozzles enter into the vials & ensure perfect wash.
· Totally fabricated from high quality SS materials including the basic frame. · All parts coming in contact with washing zones / jets are made from SS 316 material. · Water re-cycling arrangement is possible as per customer’s requirement. · Machine is totally robust and withstands continuous operation for long working hours without any trouble. Harsiddh rotary ampoule washing machine is a state of the art device that is designed to aseptically clean ampoules with minimum contact between the machine parts and the container. The equipment has a specially designed automatic gripping mechanism that holds ampoules from the neck, inverts them and cleans them before discharging them in the feed worm system at an upright position. It is suitable for busy pharmaceutical and chemical packaging industries as it has a high production output of 240 ampoules per minute and is able to clean 1ml – 10ml ampoules. Each machine has 6 washing stations, with each station having 3 needles for water cleaning and 3 for air washing. The equipment has three 25 liter tanks and three pumps to hold and pump cleaning agents. It is also equipped with a cassette of grippers at each station to hold and turn the ampoules. The machine has an automatic infeed and exit system. All internal surfaces are manufactured from stainless steel to prevent corrosion while the rests are manufactured from plastics. The fabrication and materials are made to according cGMP standards and quality is guaranteed. ü All contact parts with the internal surface of Container and the wash media are made from AISI 316L Stainless Steel. ü Other parts are made from engineering plastic, FDA approved or AISI SS 304 Stainless Steel. ü All finishes, welding joints are processed, treated & equipment selected in accordance with cGMP standards. ü Machine provides 3 water washes & 3 Air washes. ü Complete flexibility with user for washing cycle. ü Suitable for 1ml to 25ml Ampoules. ü Washing sequence can be made as per customer’s requirements. ü Each washing zone with an independent circuit to avoid contamination. 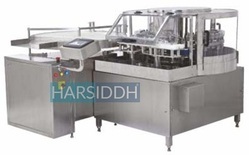 Harsiddh rotary ampoule washing machine is a state of the art device that is designed to aseptically clean ampoules with minimum contact between the machine parts and the container. The equipment has a specially designed automatic gripping mechanism that holds ampoules from the neck, inverts them and cleans them before discharging them in the feed worm system at upright position.It is suitable for busy pharmaceutical and chemical packaging industries as it has a high production output of 240 ampoules per minute and is able to clean 1ml – 25ml ampoules. Each machine has 6 washing stations, with each station having 3 needles for water cleaning and 3 for air washing. The equipment has three 25 liter tanks and three pumps to hold and pump cleaning agents. It is also equipped with a cassette of grippers at each station to hold and turn the ampoules. The machine has automatic infeed and exit system. All internal surfaces are manufactured from stainless steel to prevent corrosion while the rests are manufactured from plastics. The fabrication and materials are made to according cGMP standards and quality is guaranteed. ü Complete flexibility with the user for the washing cycle. ü Suitable for 1ml to 10ml Ampoules. ü 3 Pumps and 3 Tanks of 25 liters each. Harsiddh rotary ampoule washing machine is a state of the art device that is designed to aseptically clean ampoules with minimum contact between the machine parts and the container. The equipment has a specially designed automatic gripping mechanism that holds ampoules from the neck, inverts them and cleans them before discharging them in the feed worm system at upright position.It is suitable for busy pharmaceutical and chemical packaging industries as it has a high production output of 240 ampoules per minute and is able to clean 1ml – 25ml ampoules. Each machine has 6 washing stations, with each station having 3 needles for water cleaning and 3 for air washing. The equipment has three 25 liter tanks and three pumps to hold and pump cleaning agents. It is also equipped with a cassette of grippers at each station to hold and turn the ampoules. The machine has automatic in feed and exit system. All internal surfaces are manufactured from stainless steel to prevent corrosion while the rests are manufactured from plastics. The fabrication and materials are made to according cGMP standards and quality is guaranteed. ü Each washing zone with independent circuit to avoid contamination. Harsiddh rotary ampoule washing machine is a state of the art device that is designed to aseptically clean ampoules with minimum contact between the machine parts and the container. The equipment has a specially designed automatic gripping mechanism that holds ampoules from the neck, inverts them and cleans them before discharging them in the feed worm system at upright position. It is suitable for busy pharmaceutical and chemical packaging industries as it has a high production output of 240 ampoules per minute and is able to clean 1ml – 10ml ampoules. Each machine has 6 washing stations, with each station having 3 needles for water cleaning and 3 for air washing. The equipment has three 25 liter tanks and three pumps to hold and pump cleaning agents. It is also equipped with a cassette of grippers at each station to hold and turn the ampoules. The machine has automatic in feed and exit system. All internal surfaces are manufactured from stainless steel to prevent corrosion while the rests are manufactured from plastics. The fabrication and materials are made to according cGMP standards and quality is guaranteed. ü Suitable for 1ml to 10ml Glass Ampoules. ü In feed and Exit of containers.